The I2C (read as I square C) smart DC motor controller is designed using the Atmel 8-bit AVR Atmega168 microcontroller and configured to act as the I2C slave device where it could be controlled by other microcontroller or microprocessor through the I2C SDA (serial data) and SCL (serial clock) interface. In the first part we have accomplished a basic DC motor controller tasks i.e. differential steering and speed control using pulse width modulation (PWM). 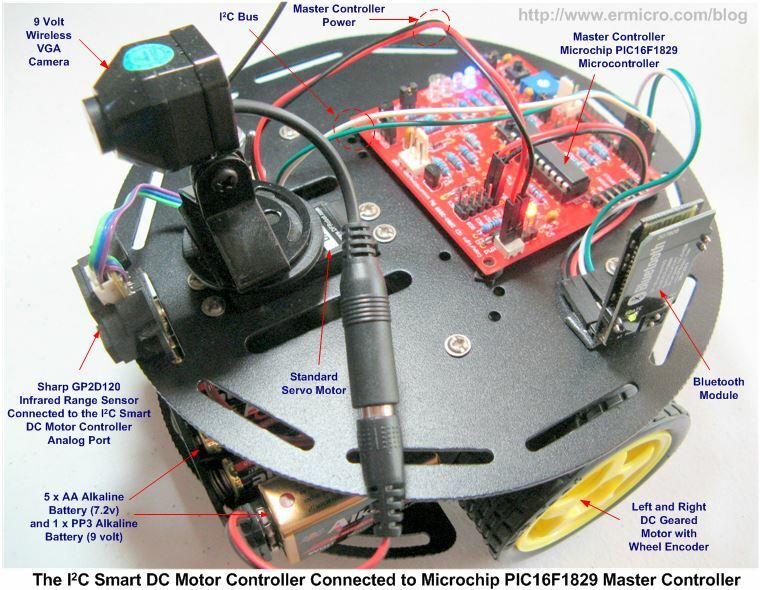 In this second part article I will put all the features described in Building the I2C Smart DC Motor Controller with Atmel AVR Microcontroller article – Part 1, this mean we will adding more features to the I2C smart DC motor controller firmware which include wheel rotation and servo control. 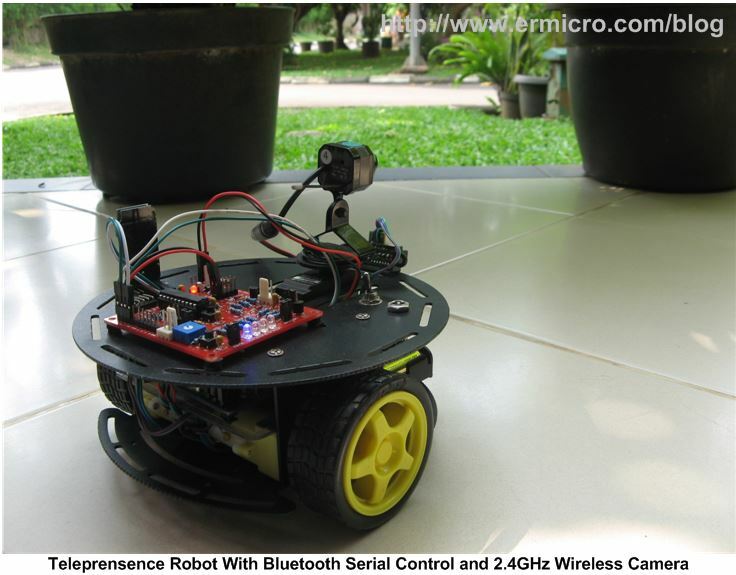 In order to make it more interesting and fun, in this part 2, I will build the telepresence robot which equipped with wireless serial protocol over Bluetooth, wireless 2.4Ghz camera mounted on the standard servo, and Sharp GP2D120 infrared range sensor as shown in this following picture. The telepresence robot basically is a remote operating robot equipped with camera and sensors, therefore we could operate the robot from distance. Telepresence robot is used in many institutions in the world such academic/research, military, and space exploration to explore remote location or area where is too danger for human being to be present at that particular location. Therefore as an electronics hobbyist building this kind of robot is just a dream in many years ago because it is expensive, but nowadays as more and more cheap and sophisticated wireless electronic modules are available in the market, now we could take part in the excitement of controlling this telepresence robot from our own mission control laptop at home as I did (see the video at the end of this article). This articles also serve as a learning purpose of how we could combined two most popular 8-bit brand microcontrollers in the market i.e. 8-bit 20 pin PIC16F1829 microcontroller from Microchip as the I2C master controller where it will communicate through a serial Bluetooth protocol to a laptop and to the Atmel AVR ATmega168 microcontroller that serve as the I2C slave for controlling DC motors, servo, and reading an analog input. 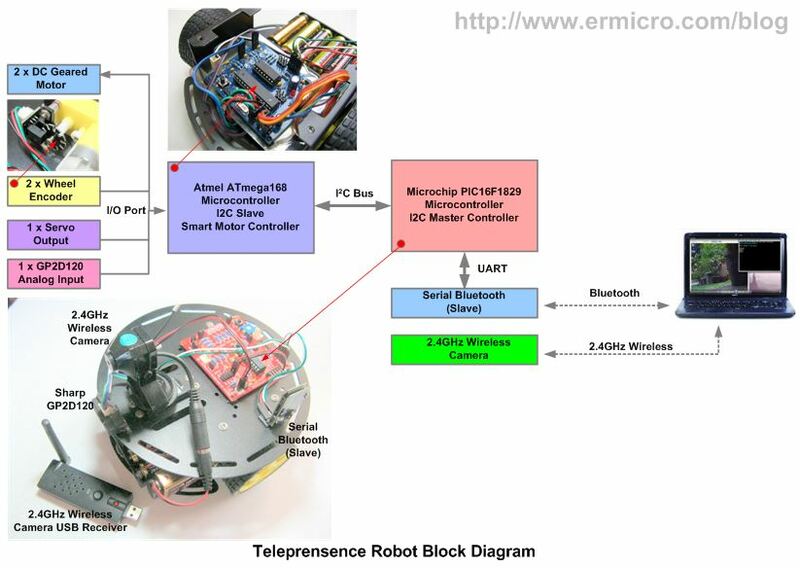 The following picture show the block diagram of the telepresence robot we will build in this article. 9. Microchip Serial Bootloader AN1310 v1.05r, to program the AVRJazz 20PIN board. 13. Atmel AVR ATmega168, Microchip PIC16F1829, SN74LVC1G14, and L293D Datasheet. // 0.16% Error for 16 MHz Oscillator Clock. Actual Rate will be 9620. _delay_ms(10);                  // Delay 10 ms.
INTCON=0;               // Disabling the interrupts. In this second part, I will implement all the features mentioned in part 1, therefore we will quickly walk through some of the I2C Smart Motor Controller important features. The wheel rotation control is one of this smart motor controller feature, where we could instruct to rotate the wheel in unlimited time or in specified time such as 5 seconds, or we could say in 10 rotations. Therefore in order to achieve this goal we need to add a wheel encoder as shown in this following picture. When the wheel rotate it will generate a pulse according to the wheel encoder disc pattern, which block and un-block the infrared (IR) beam emitted to the photo transistor. The photo transistor will be turn ON and OFF and the output is feed into the Schmitt trigger inverter SN74LVC1G14 to make the pulse transition smoother. By using the ATmega168 AVR external interrupt request INT0 (PD2) for left wheel encoder and INT1 (PD3) for right wheel encoder, we could easily count the pulse generated by the wheel encoder. 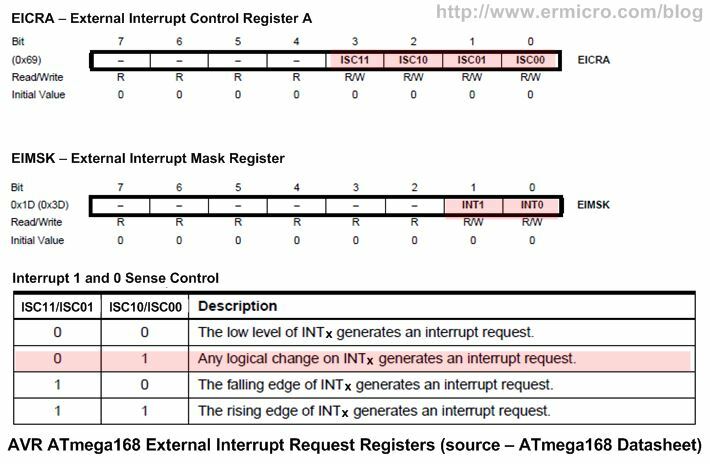 The AVR ATmega168 microcontroller external interrupt request is controlled by EICRA (External Interrupt Control Register A) and EIMSK (External Interrupt Mask Register). To achieve maximum resolution from the encoder disc which has 20 PPR (Pulse per Rotation) resolution, we set the ISC11 and ISC10 bits to logical “0” and the ISC01 and ISC00 bits to logical “1”. This setting will generate interrupt every time the input logical change i.e. low to high or vice verse. 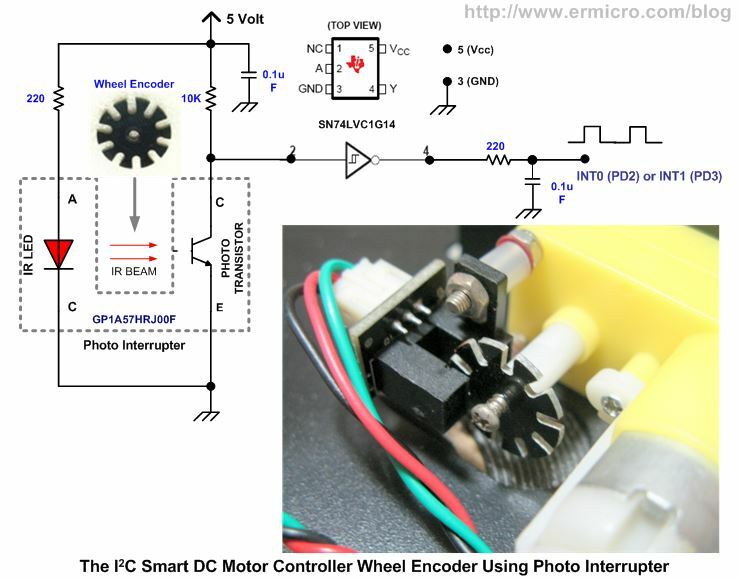 In this implementation of the I2C smart motor controller we only activate one external interrupt request at the time as we only want to control the rotation and degree on one particular wheel at the time. Next the actual wheel encoder pulse count is implemented in ISR(INT0_vect) and ISR(INT1_vect) function. Next the 1 second timing is implemented in ISR(TIMER0_COMPA_vect) function where the count_dur variable will be compared to the motor_dur variable in order to determine the wheel rotation timing. 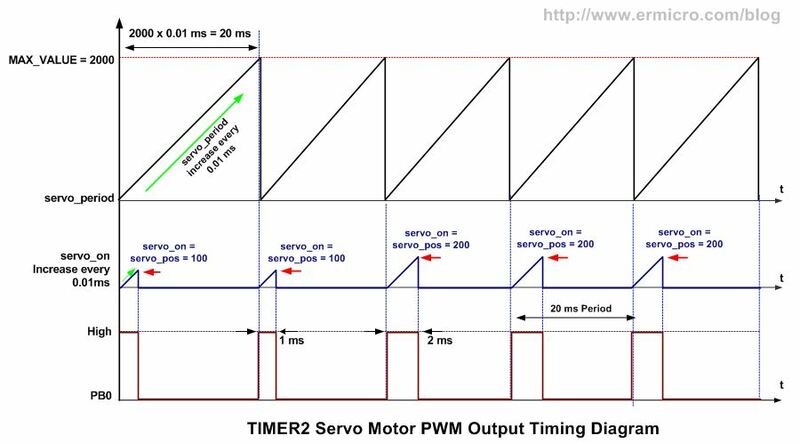 You could get more information about TIMER0 peripheral on the Working with AVR microcontroller Communication Port Project article. Therefore by controlling the PWM width timing we could easily move the servo arm at the precise position. For example to move clock wise (CW) slightly from center we could supply a pulse width of 1.6 ms or to move counter clock wise (CCW) slightly from maximum CW we could supply a pulse width of 1.1 ms. Therefore by increasing the pulse width from 1.0 ms to 2.0 ms we could move the servo’s arm smoothly from maximum CW to maximum CCW or by decreasing the pulse width from 2 ms to 1 ms we could move the servo’s arm from maximum CCW to maximum CW. The servo_period variable inside ISR(TIMER2_COMPA_vect) function is used as a counter which keep the servo PWM period length of 20 ms. When it reach the maximum value of 2000 (MAX_VALUE), then the PB0 of PORTB will be turned ON. Next the servo_on variable will start to increase and it is used as a counter to control the pulse width period, when the servo_on value reach the servo_pos variable value then the PB0 will be turned OFF. 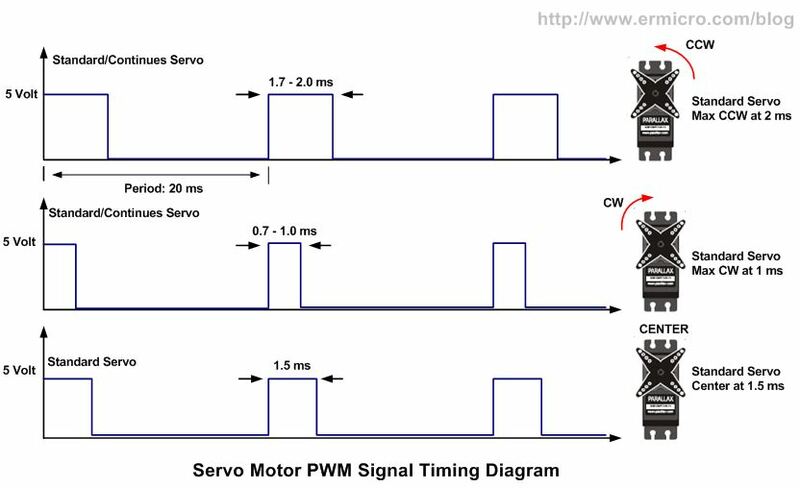 The following servo motor PWM timing diagram will show you clearly of how it works. When the ADC feature is enable then the ADC input reading will take place inside the while(1) infinite loop which return the lower 8-bit value in adc_low variable and the high 2-bit value in adc_high variable. As described in part 1, in order to communicate efficiently with this I2C Smart Motor Controller, We used a protocol where we treat the I2C Smart Motor Controller board as the I2C slave device which has several 8-bit control registers. Each of these registers will implement one or more functions. Therefore by simply writing to or reading from these registers we could easily control this board. When the last statement is executed, both the left and right motor will start to move with 70% of speed, with the MSTEER register is assigned to 110, the right motor will get less power compared to the left motor, therefore it will move forward slightly to the right. The motor steering is implemented in MotorSteering() function. By setting the bit 4 and 3 in MCONTL register we could select the duration (e.g. rotation) and the length of duration is determined by the value assigned to MDURA register (e.g. 10 rotation). 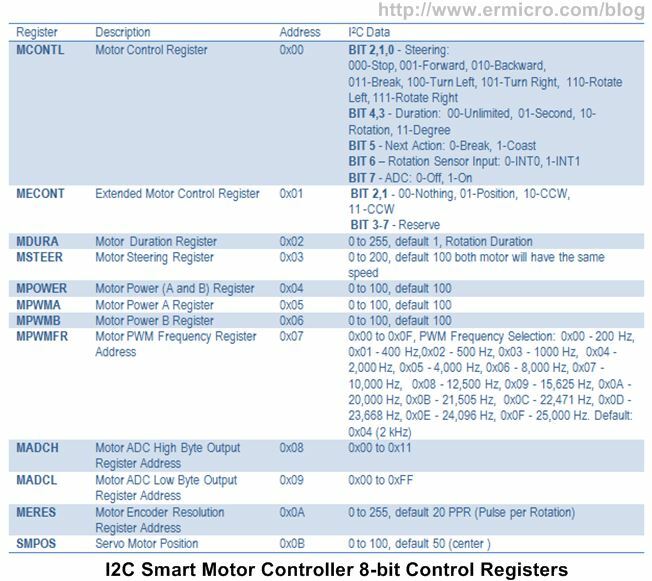 The following is a complete list of the I2C Smart Motor Controller 8-bit control registers. As you notice, because the ADC value is stored in MADCH and MADCL registers, therefore in order to get the 10-bit ADC result we need to combine these values as we assign them to the analog_read variable. When prototyping the I2C Smart Motor Controller board (AVR ATmega168 microcontroller), I used similar microcontroller family i.e. AVR ATmega328 microcontroller as the I2C master controller, so I don’t have to change the IDE (Integrated Development Environment) and programmer when testing all the I2C Smart Controller board features. And because both microcontroller have similar I2C peripheral, therefore debugging the program become fast and easier. Once it work, we could change the I2C master controller to a different microcontroller brand. In this article I used Microchip 8-bit 20 pin PIC16F1829 microcontroller, which has a different I2C peripheral and programming environment compared to the Atmel AVR microcontroller families. UART (Universal Asynchronous Receiver Transmitter) is one of popular method widely used in embedded word to communicate serially with other devices. Therefore today there are many kind of wireless UART/TTL (Transistor-transistor Logic) interface module available on the market. The terms TTL means the UART module is designed to interface with standard TTL logical voltage level (i.e. 0 to 5 volt) instead of RS232 signal voltage level specification (i.e. +/- 3 volt or +/- 12 volt). In this project I used the Bluetooth UART/TTL for practical reason as most of laptop or Smartphone has already equipped with the Bluetooth peripheral, therefore to establish a serial Bluetooth communication with all of these devices is easier. The only drawback of using Bluetooth device is the radio transmitter range is limited, in my case is about 10 meters line of sight. Mean while the APC220 Wireless UART/TTL shown above have a range for about 1000 meters, but you need to have a pair of it in order to be able to setup a serial radio link. 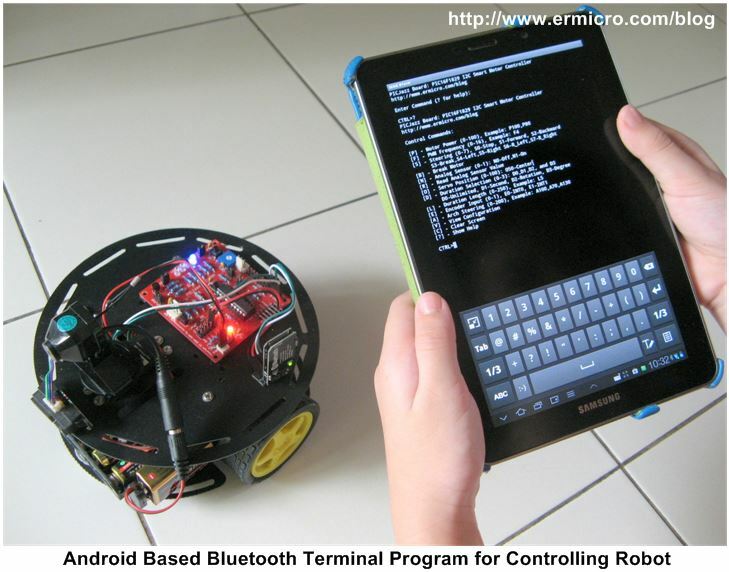 To control our robot remotely through the wireless UART serial communication, we need to create a simple command line that will be entered from the serial terminal program such as TeraTerm or Putty on MS Window platform, or you could use the Bluetooth Terminal program on Android platform (I used SENA BTerm application). 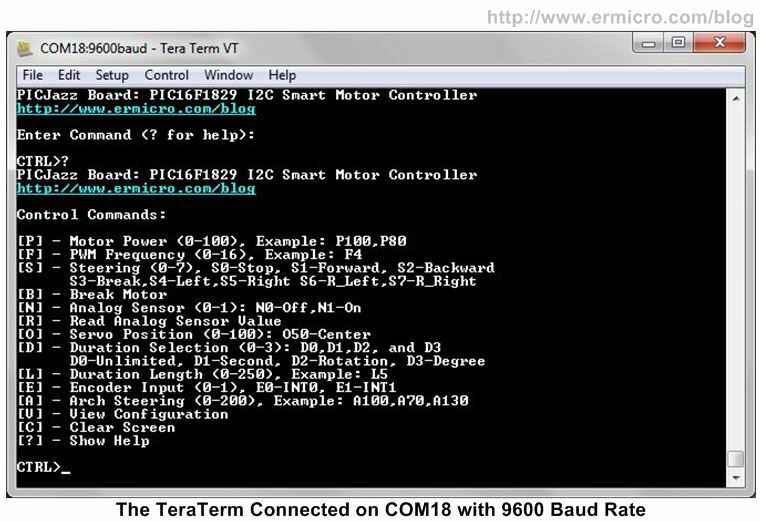 This command line than will be interpreted by the I2C master controller and pass the command to the I2C Smart Motor Controller board. 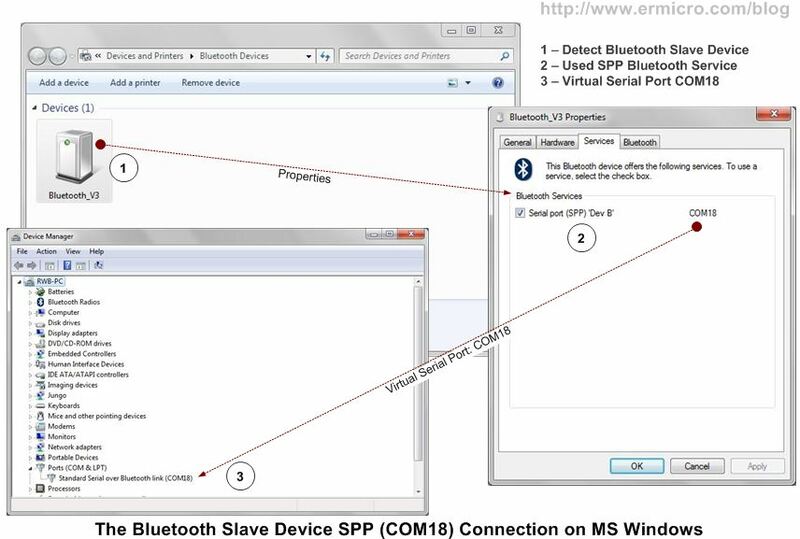 The Bluetooth module will be act as a slave Bluetooth device that connect to the PIC16F1829 microcontroller through the EUSART (Enhanced Universal Synchronous Asynchronous Receiver Transmitter) peripheral with a standard 9600 baud rate and 8-bit data. As you could see from the example above, although this command line looks odd, but this a simple and neat solution to communicate with a serial enabled device. The command line protocol principle that I used here could be traced way back in the days when most of the legacy system mainly used the RS232 to communicate with different dumb terminals types and brand such as Wyse 60 or DEC VT100. Each type of this dumb terminal need to be controlled by a special command protocol which usually a combination of ASCII characters and numbers. Nowadays you still could found this obsolete protocol in the /etc/termcap file on major Linux operating system distribution. Once we determined and tested all the necessary commands line to control the telepresence robot, it would be easy to develop a graphics user interface (GUI) application that will encapsulate all the commands and communicate directly to the telepresence robot through a serial communication protocol. 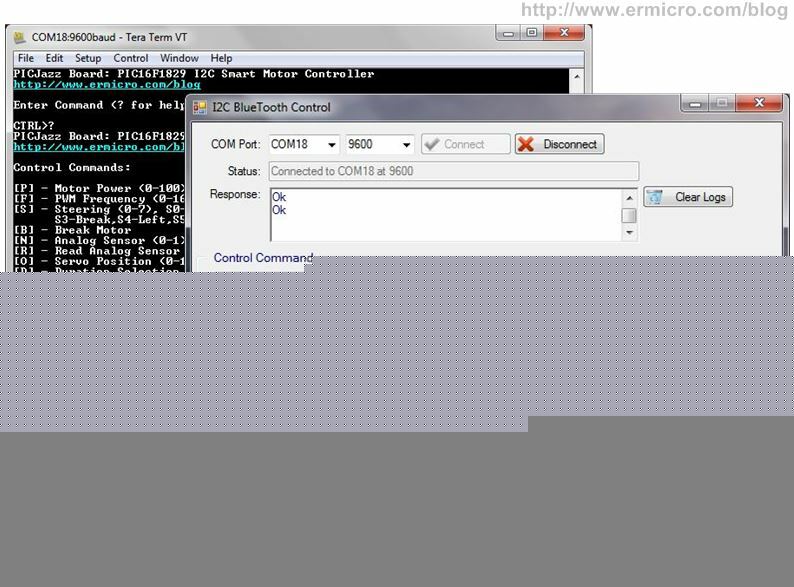 Therefore in order to make operating this teleprensence robot fun and enjoyable, I build a simple MS-Windows based application named “I2C BlueTooth Control” using MS Visual Basic 2012 that transform all the commands line into a nice GUI button or slider and connect the serial communication directly to the Bluetooth device as shown in this following picture . 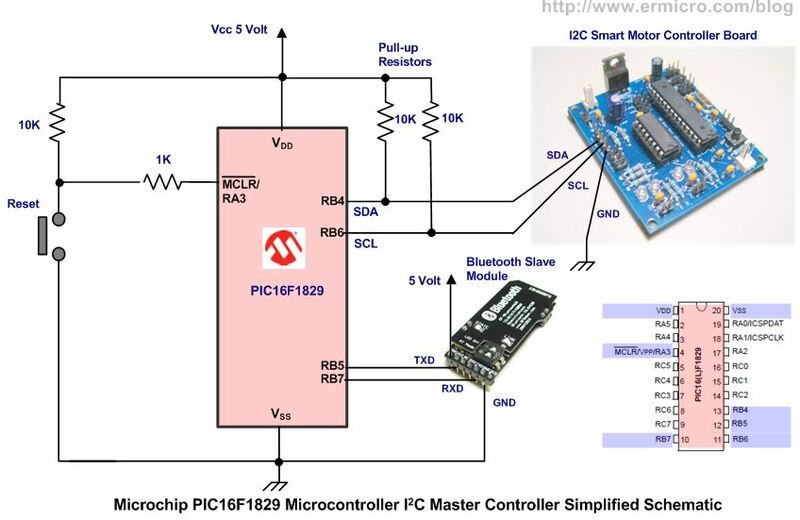 The Microchip PIC16F1829 microcontroller I2C peripheral is the part of Master Synchronous Serial Port (MSSP) peripheral and there are two MSSP peripherals (MSSP1 and MSSP2) in PIC16F1829 microcontroller. Each module could be operated in one of the two modes: Serial Peripheral Interface (SPI) or Inter-Integrated Circuit (I2C). The I2C module support both I2C master and I2C slave modes, where in this project we will use the I2C Master mode on MSSP1. 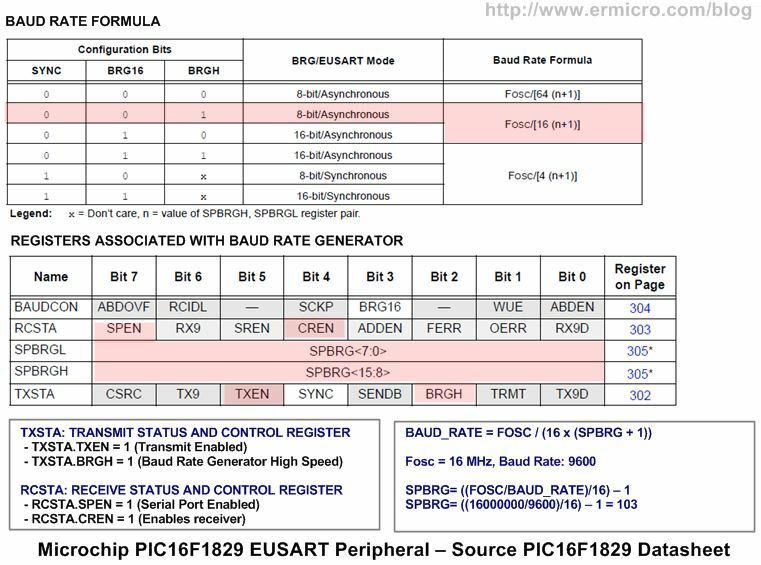 You could read more about using the Microchip MSSP peripheral in Interfacing the Microchip PIC18 Microcontroller Master Synchronous Serial Port (MSSP) Peripheral to various I2C Devices article in this blog. I2C_init() – initialized the PIC16F1829 MSSP1 peripheral in I2C master mode at 100 kHz. Now you could watch and enjoy the entire project presented here on this following video, where you could see how this telepresence robot in action. In this project we’ve learned to use a different microcontroller brand (i.e. Atmel AVR ATmega168 microcontroller and Microchip PIC16F1829 microcontroller) to achieve our goal, even though most of the embedded system designers tend to use a similar microcontroller family in their design in order to reduce cost in production. It is a good practice to every embedded system designers not to be “locked” in the particular microcontroller type, but keep open their mind to the other microcontroller type or brand in order to broaden their knowledge. In the final part project (Part 3), I will use different microcontroller board as the I2C master controller to control this I2C Smart DC Motor Controller. Wow that was awesome. I have always enjoyed your avr/pic projects. I have gained a lot from this post. Keep it up. I look forward to the next.